How are events color coded? An item is given the color of the item's calendar, to begin with. It can get a different color if it matches one of your statuses. The item's status colors are based on the contents of a field of your choosing. We call this field the event "status" in the documentation and field mapping, but you can use any field you'd like and translate the interface to call it something else: "department", "category", "state". You can also add colors by styling the text in an event: see Event Styles . Setting up color coding begins in field mapping where you're asked which field DayBack should us for "status" (should use for color coding). We suggest using "status" for something temporal about the item (like its confirmation status) and use resources for more concrete facts about the event like where it is or whose it is. When the value of that field matches one of the values in DayBack's list of status filters then you'll see colors in your event. 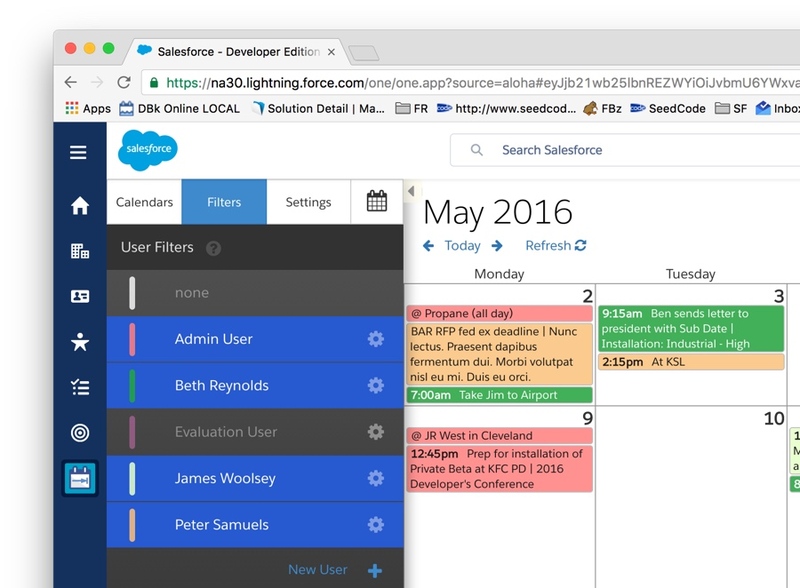 Color Salesforce Calendar by Location from SeedCode on Vimeo. Here are some tips for creating and adjusting status colors. Click the "+" button below the list of status filters to make a new one. Select the color you'd like by manipulating the color picker. It consists of three columns. The left, and widest, lets you fine-tune the color. The middle column lets you pick the general color spectrum, and the third column adjusts the transparency. Click on the gear icon beside an existing color to edit or delete it. Note that deleting or renaming a color here doesn't change the value of that field in any items that may be using that status/color. 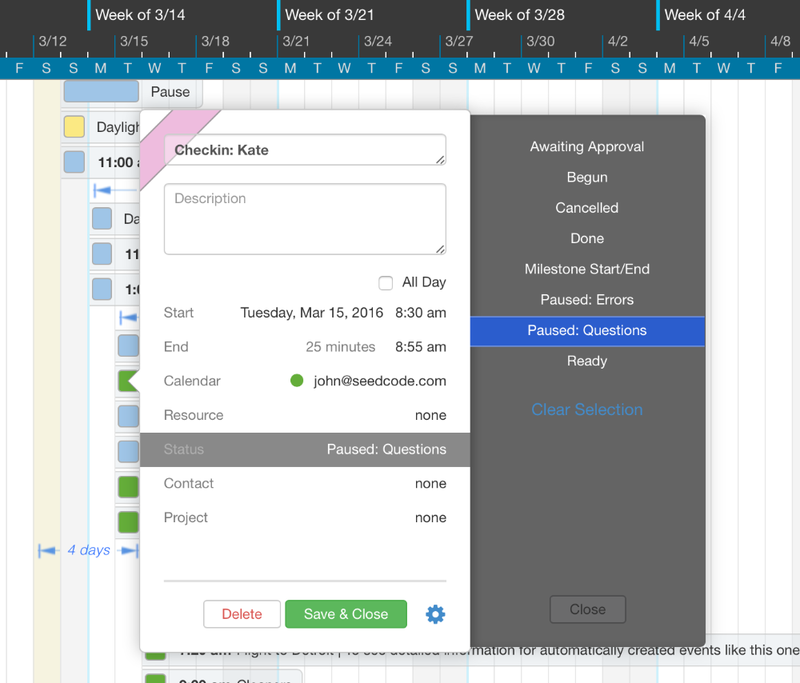 Can I color code by calendar instead of by a field? 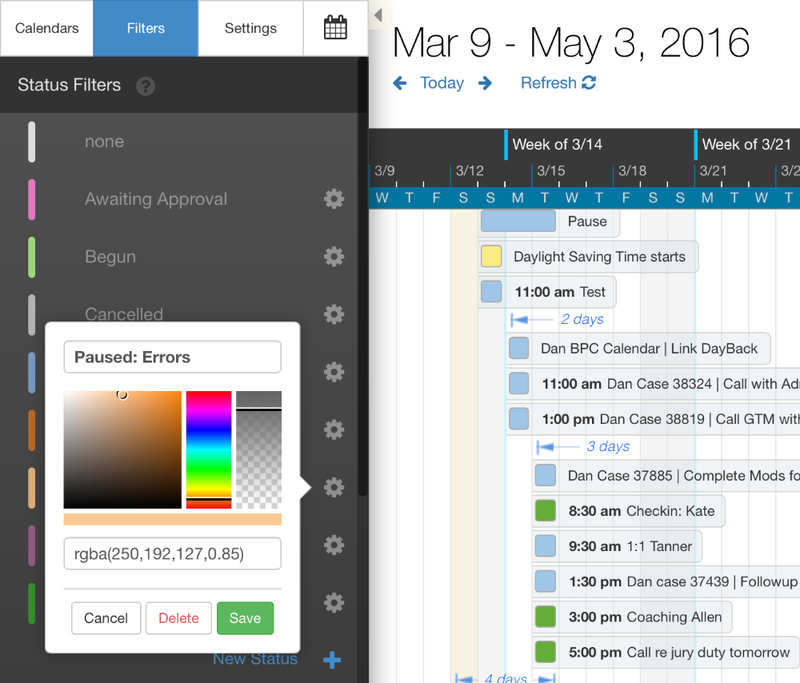 Yes, if there is no field mapped to "status", items will take their color from the calendar. If you're not using statuses for this source you can mark the source's status field as "unused" below Source Settings where you do the field mapping. Can I base the item's color on a Salesforce formula? If you haven't changed the CSS before, it's easy. Here are the instructions: changing CSS. This can cause an issue when creating a new Event with a status filter selected as DayBack will apply that status to the new Event. DayBack will try to save the Event with that status and Salesforce will throw an error that the formula field cannot be edited. To prevent this behavior you can add a simple Event Action to the source that will prevent any edit to the status field. This will be on On Save action and Prevent Default Action should be turned off. Can I base the item's color on a FileMaker calculation? This status field isn't something you want users to modify: it's pointed at a formula field after all. So you'll hide it in the popover following the instructions a couple of sections above under "Can I base the item's color on a formula?". Where DayBack lists the status filters and their colors in the sidebar you'll enter your users' names: the same names returned by the calculation in step 1. Finally, you'll likely want to change the word "status" to "users" globally: that is best done in DayBack's tran slation settings.